The University of North Carolina Health Care system was established in 1998 by the North Carolina General Assembly. 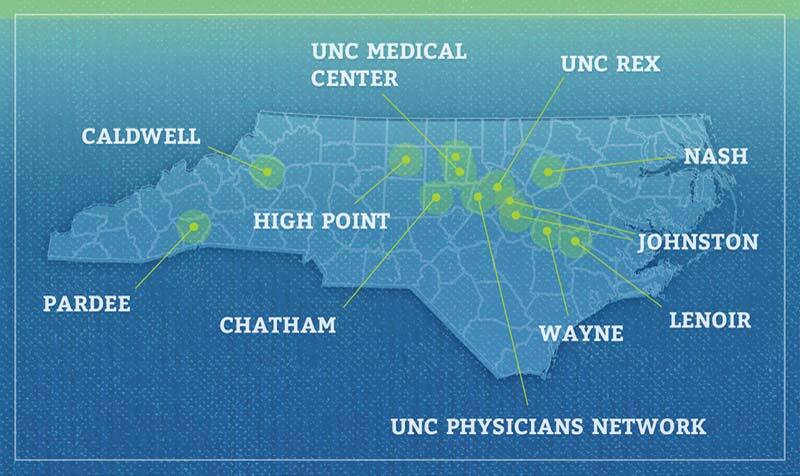 Originally comprised of UNC Hospitals and the clinical care programs maintained by the UNC School of Medicine, the system has grown to include hospitals and regional health care systems across the state, as well as an ever-growing network of physician practices. The N.C. General Assembly appropriates funds for the construction of North Carolina Memorial Hospital. N.C. Memorial Hospital opens and welcomes the first students of the newly expanded program at the School of Medicine. N.C. Memorial Hospital is renamed UNC Hospitals, a unifying organization created by an act of the North Carolina General Assembly to govern its constituent hospitals. N.C. Neurosciences Hospital opens in Chapel Hill. UNC Health Care system is established by the North Carolina General Assembly with the passage of NCGA 116-37. Its stated purpose is to provide patient care, educate physicians and other health care professionals, advance research and promote the health and well-being of the citizens of North Carolina. UNC REX Healthcare joins UNC Health Care. N.C. Women’s Hospital and N.C Children’s Hospital move to a new free-standing facility in order to provide high-quality care in a family-friendly environment. Chatham Hospital joins UNC Health Care and moves into a new 25-bed facility in Siler City. Pardee Memorial Hospital in Hendersonville enters into a 10-year management agreement with UNC Health Care. High Point Regional Health system joins UNC Health Care. As part of the agreement, UNC Health Care agrees to commit $150 million for capital improvements and $50 million for the establishment of a community health fund. Pardee Hospital and UNC Health Care strengthen their partnership by extending the terms of their management agreement from 10 years to 25 years. Caldwell Memorial Hospital joins UNC Health Care. Johnston Health Care and UNC Health Care finalize a joint venture partnership. The partnership includes capital investment intended in part to expand the Johnston Medical Center in Clayton. Nash Health Care joins UNC Health Care under a management services agreement. Wayne joins UNC Health Care. First opened in 1896, Wayne UNC Healthcare continues to provide the Wayne County community with advanced and compassionate medical care as part of the UNC Health Care system. Lenoir joins UNC Health Care. What is now UNC Lenoir Health Care began in 1906, when a family home was donated and transformed into a 20-bed hospital, known as the Robert Bruce McDaniel Memorial Hospital. They continue their tradition of excellence today as a part of the UNC family.